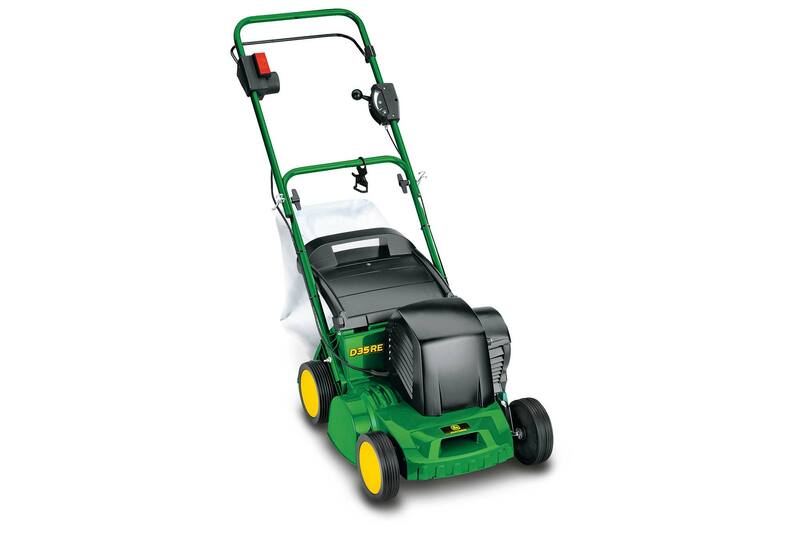 Help maintain a healthy lawn using the 35cm John Deere D35RE Scarifier to remove moss and thatch. Lighweight yet robust, perfect for small lawn areas. In summer, grass and plant clippings often accumulate between blades of grass. After a while, the surface becomes matted and the soil is blocked off. This means water, air and nutrients can no longer reach the grass roots. As a result, grass growth slows down and the lawn looks unhealthy. It takes proper care to create and maintain a healthy lawn. This includes regular scarification – the process of physically removing thatch and moss so nutrients can find their way into the soil. The best times to remove thatch are late spring and autumn. Robust steel blades ensure that moss and thatch are removed effectively. Our scarifiers are the effortless way to breathe fresh life into your lawn, making it thicker and healthier. However big or small your garden, our lecectric and petrol scarifiers can revitalise your lawn and transform it to a picture of health. Your lawn should be at least three years old before the first scarification. Always mow the grass as short as possible before you begin; an average height of 4cm is ideal. If possible, work when the soil is thoroughly dry; this will prevent damage to the machine and keep the resulting grooves open. Like many walk-behind lawn mowers you can use this handy bag to collect the unwanted moss and lawn thatch during your scarification.